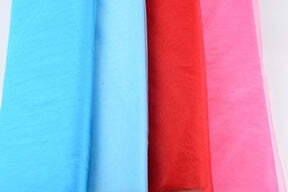 Premium glimmer tulle fabric is a versatile fabric that is used in variety of wedding and party decorations. It comes in all attractive colors like sparkling turquoise, pink and ivory, white gives you pleasant feeling to your occasions. You can use it in decorating curtains and drapes with elegant forms and patterns. Our fabric specialty goes beyond your expectation, as it can be used as ribbon for garnering ladies hairstyle and accessories. Wedding look for a bridal will be adorable with our glimmer tulle fabric. To enjoy the best wholesale fabric deal, register with best price and offers.